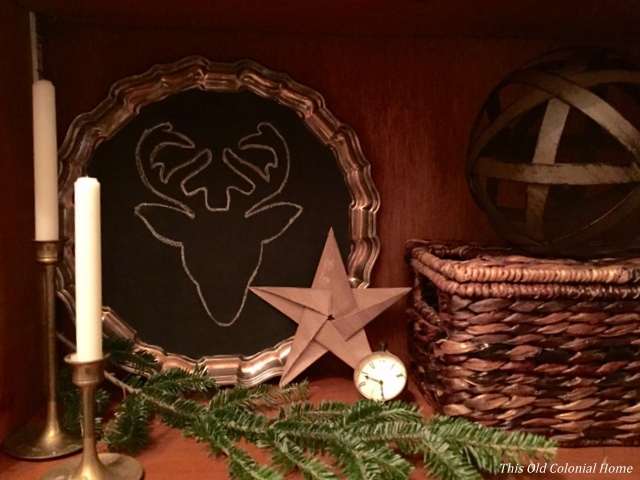 As if this time of year isn’t busy enough with all the decorating, shopping, wrapping, baking … I decided to throw a few Christmas crafts into the mix as well. I just can’t help myself! 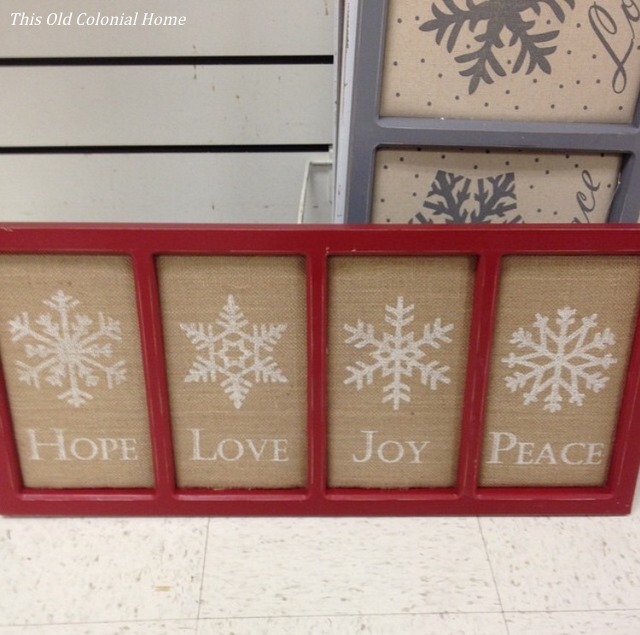 It kind of all started when I saw this cute sign at Marshalls. 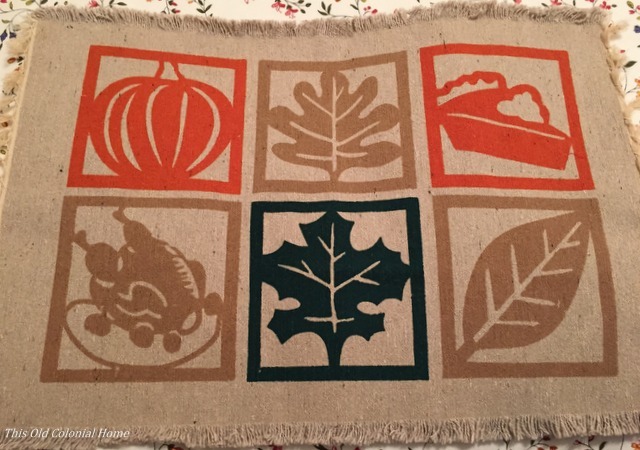 I love its rustic vibe, but I didn’t love its $25 price tag. So I figured maybe I can make something similar. I ended up using this framed mirror that I had lying around. 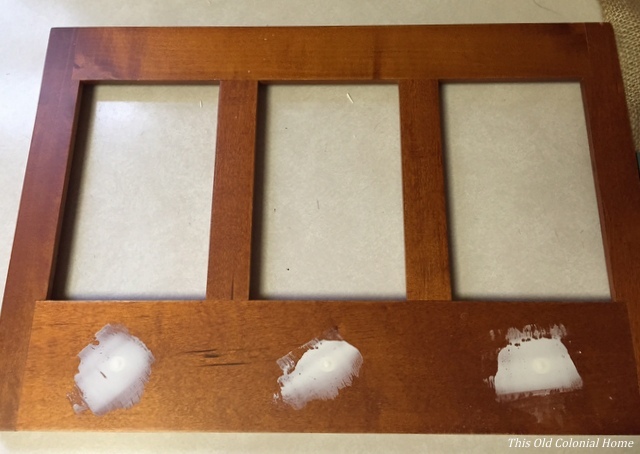 I didn’t want to keep the hooks, so I took them off and filled the holes with spackle. 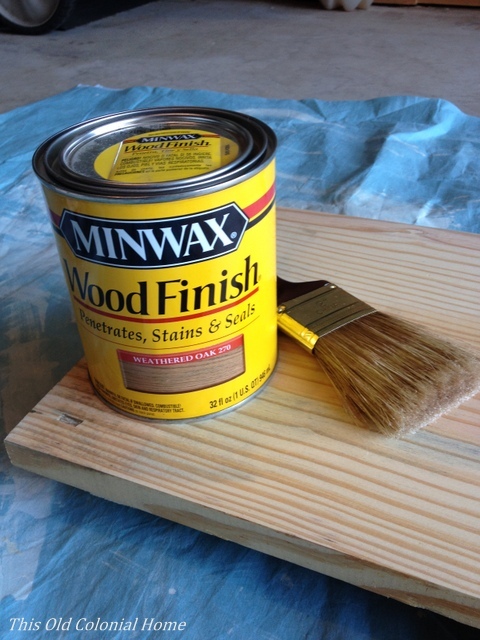 Wood filler would also do the job. 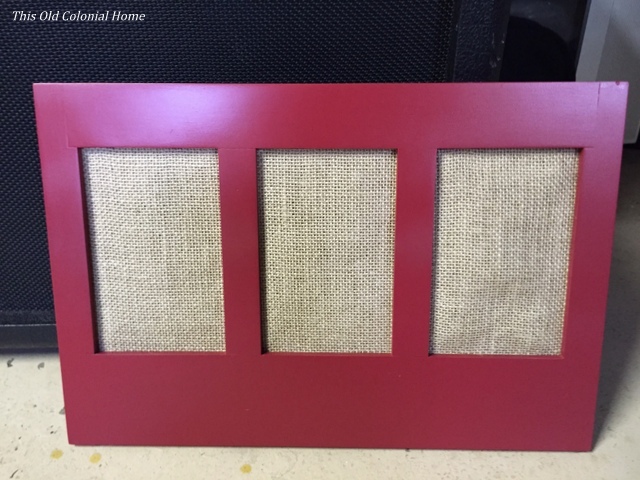 While I waited for that to dry, I covered the mirror in a brown paper bag and then some burlap. Once the spackle was set, I lightly sanded the entire frame. Then it was time to spray paint! It only took 2 or 3 quick coats. 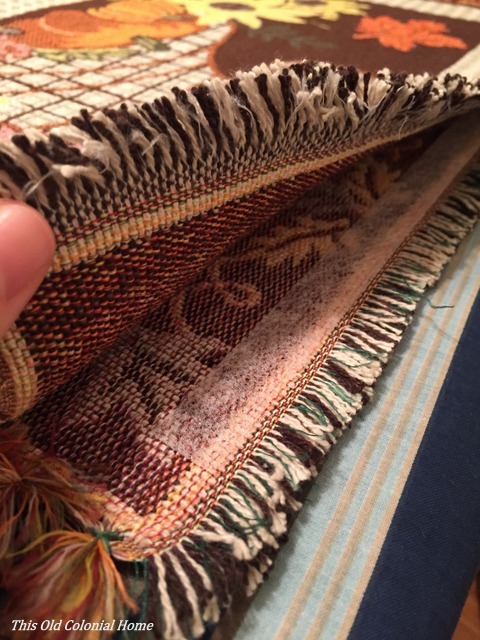 After it was dry, I reinserted the now burlap backing. Then I simply used a snowflake stencil that I picked up at Party City for 99 cents. I used white paint I already had on hand and bought a foam pouncer from Michaels for around $2.50. Now granted my sign is a lot smaller than the one at Marshalls, but for less than $5 I’m pretty happy with it! 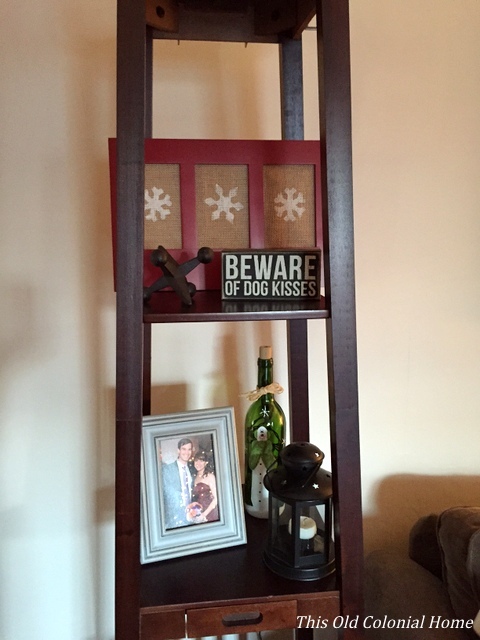 Eventually I would like to add some wording along the bottom, like ‘Let it Snow,’ but for now it still brings some holiday cheer to our living room. In addition to the sign, I also made some fun, Origami stars using festive scrapbook paper. I’ve only done Origami a few times and the last time was probably when I was in 6th grade! But this video tutorial I found through Pinterest was really easy to follow! If I can do it, so can you! 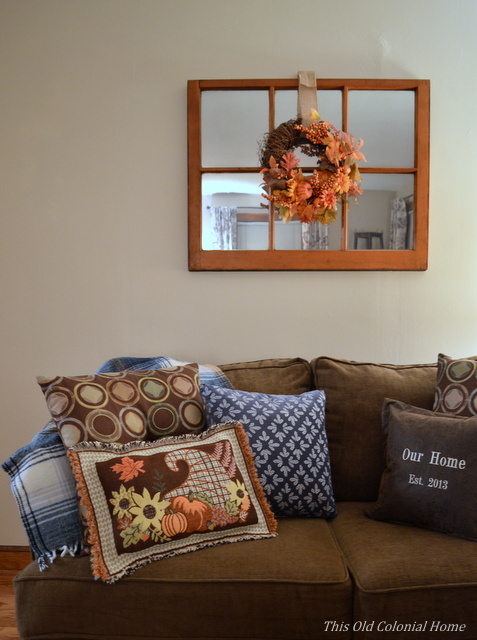 And last, but not least — I couldn’t resist making some more no sew throw pillows! 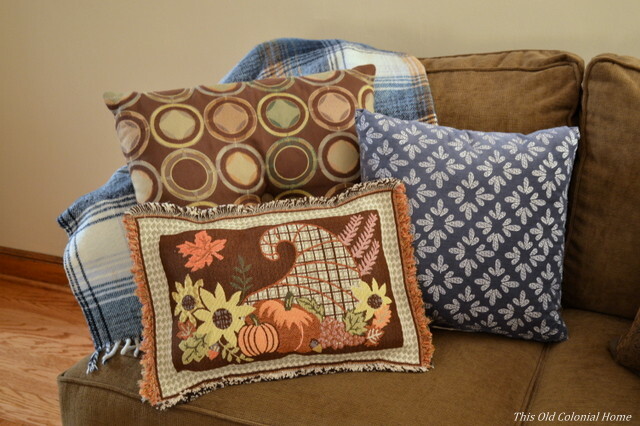 I followed the same method as my placemat pillows, but this time I used kitchen towels. 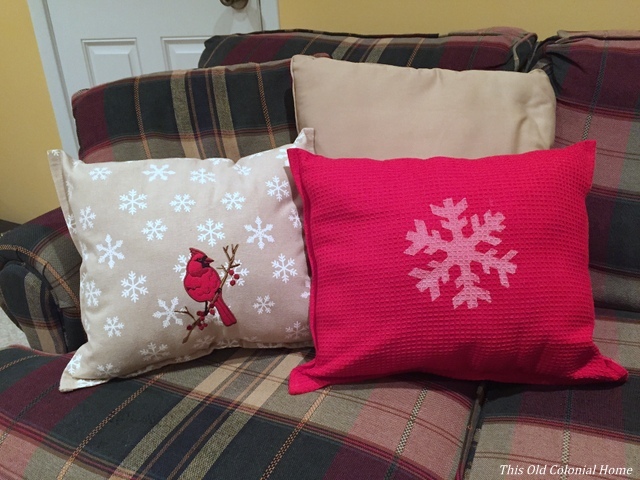 The red one was actually plain, but I stenciled on a big snowflake! 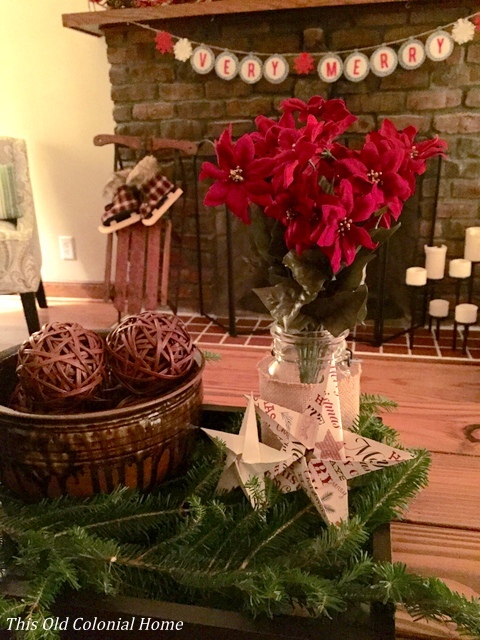 It’s another easy and inexpensive way to add some more Christmas cheer around the house! 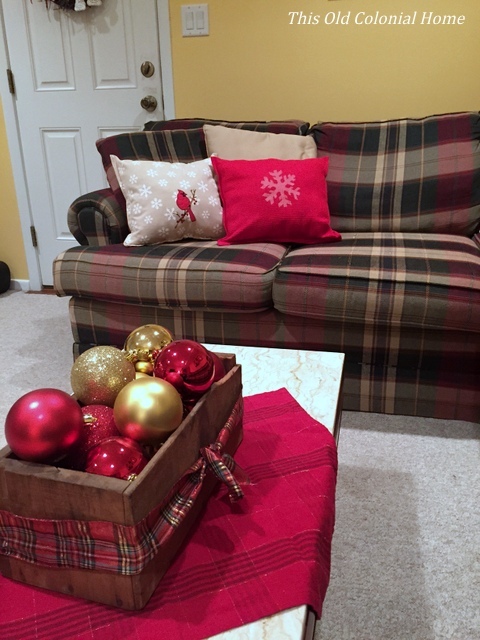 Categories: Christmas, Crafts | Tags: no sew, Origami, Rustoleum, snowflakes, spray paint, stars, throw pillows | Permalink. When it comes to sewing, my skills are pretty limited. I can reattach buttons and … nope, that’s it. I hope to change this one day and actually learn how to use a sewing machine. But until that day comes I’ll be using no sew methods that I come across. Exhibit A: You guys, I actually made this little pillow! (Patting myself on the back.) 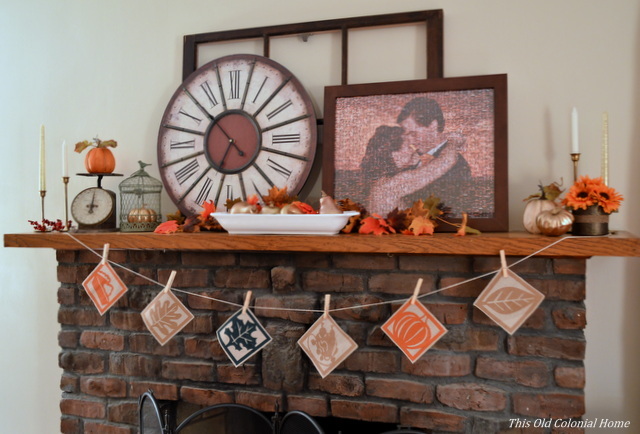 Can you believe these are actually placemats from the dollar store? 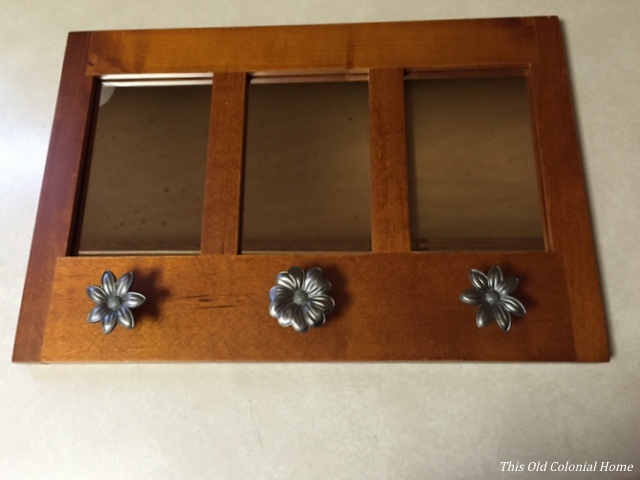 This was such an easy and inexpensive project. 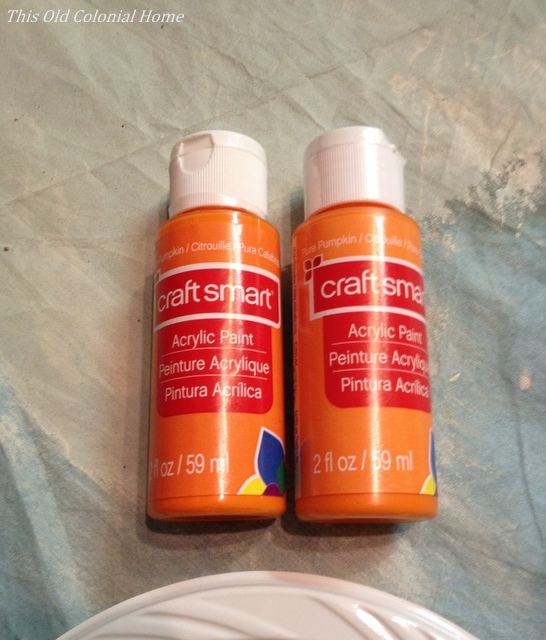 The only other supplies I needed were stitch witchery and pillow filler, which I picked up at Michaels. 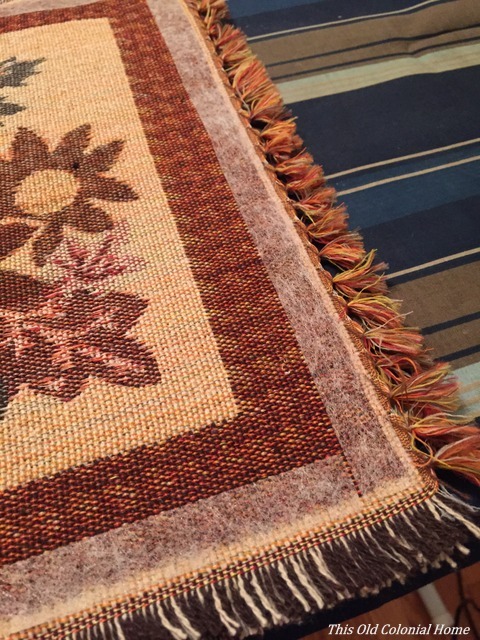 To make the pillow, I started by laying the placemat face down and cutting strips of the stitch witchery for along the edges. I then lined up the other placemat laying it face up. 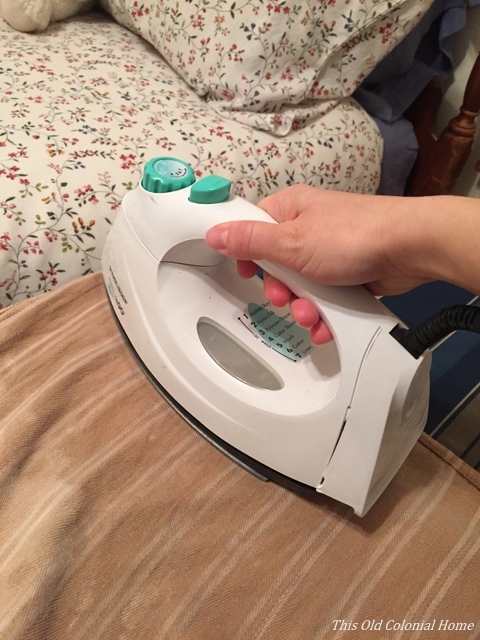 To get the tape to adhere to the placemats you cover the fabric with a damp press cloth and use a steam iron on the wool setting and press for about 10 seconds on each side. I didn’t have a press cloth so I just used an old kitchen towel, which worked fine. I went around three sides and let it cool before adding the pillow filler. Once my filler was in place, I tried ironing the last seam, but had a little difficulty getting it to stick. 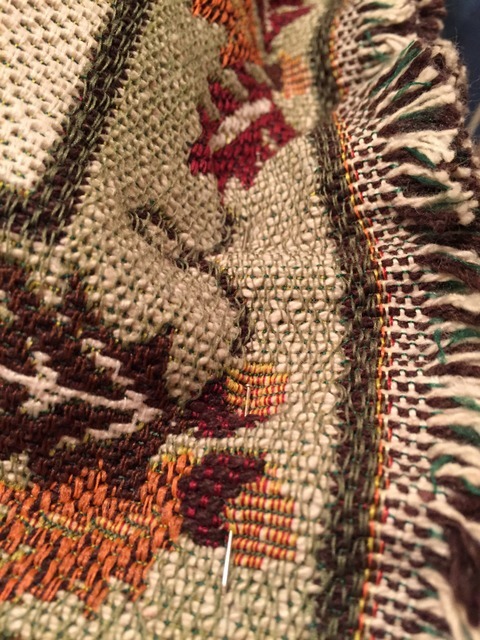 So I pinned it down just above the stitch witchery to help keep it in place. That definitely worked better. 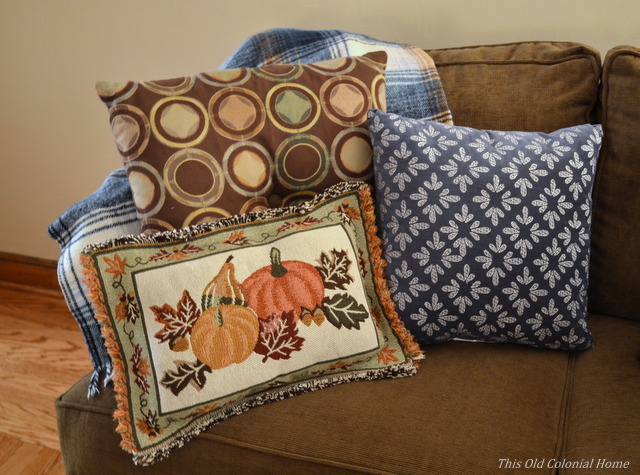 And after just a few more presses, my pillow was complete! I probably could have stuffed it a little more, but hey, not bad for my first try I’d say. I have a lot left over, so I’ll definitely be making more of these. Maybe as Christmas gifts? Hmm. 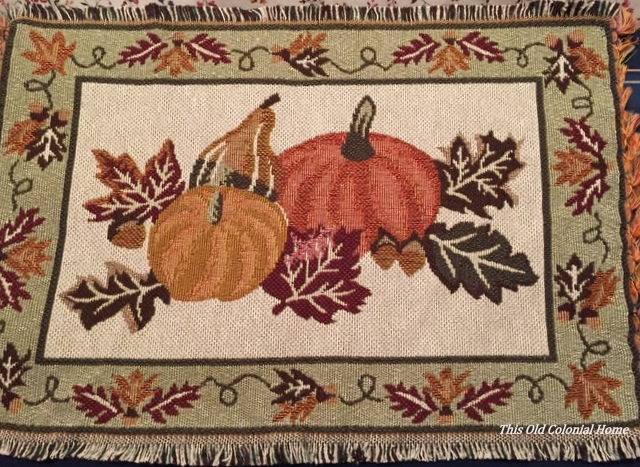 As for the original placemat … I ended up making it into a banner for our mantel. 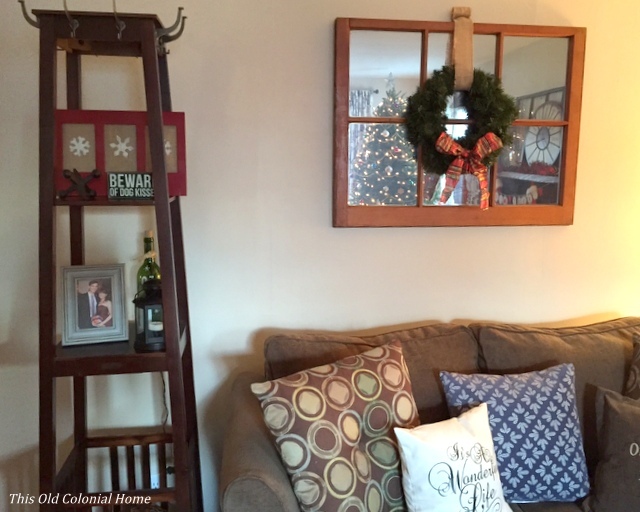 All I did was cut out the squares and attach it to twine with some clothes pins – items I already had on hand. Easy peasy! What do you think? 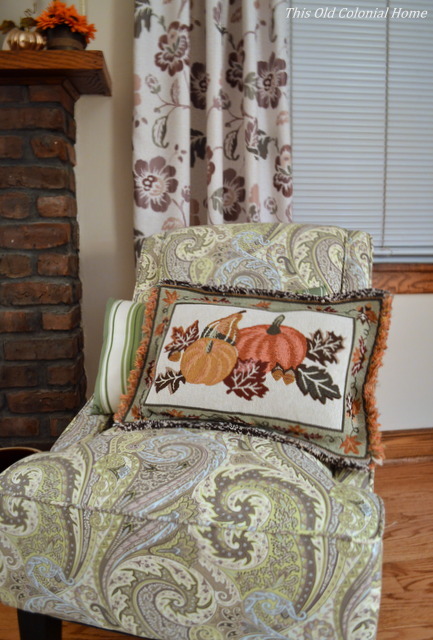 What no sew items have you made? 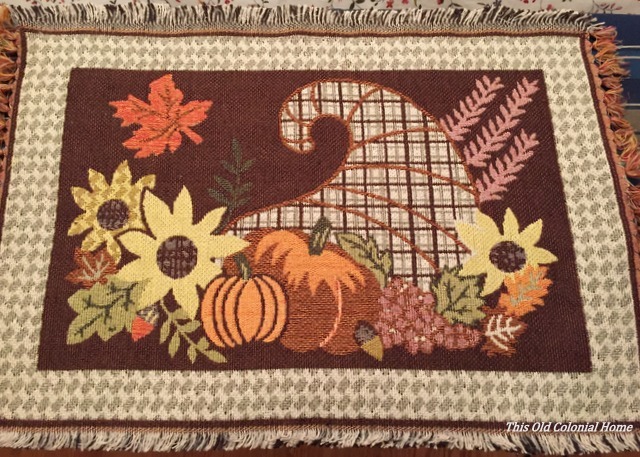 Categories: Crafts, Fall | Tags: crafts, no sew, pillow, placemats, stitch witchery | Permalink. 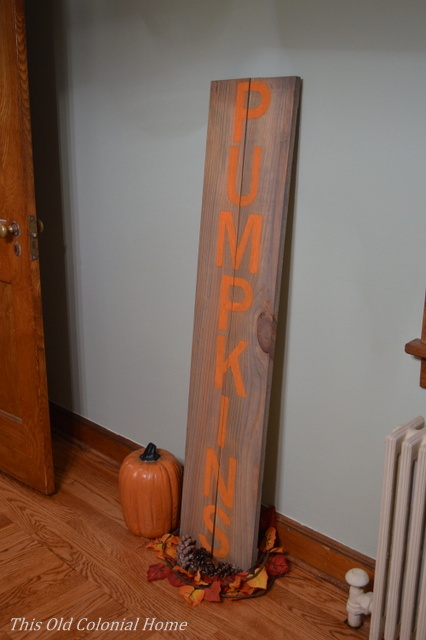 Somehow I got it in my head that I wanted to make a wooden sign for fall. I’ve never made a sign before. But isn’t that kinda what DIY is all about? Winging it? Learning as you go? 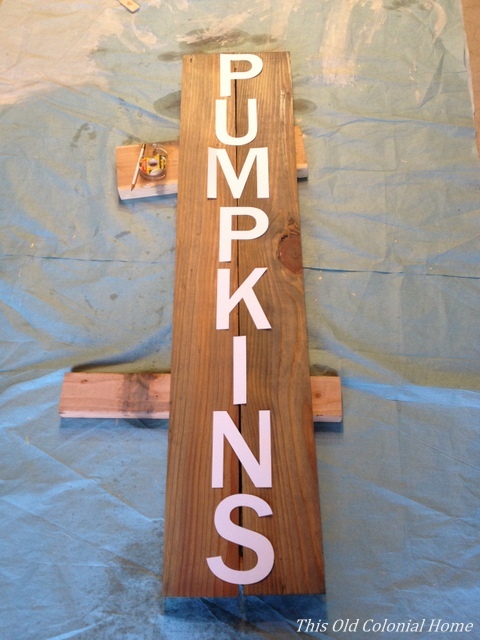 I envisioned a rustic, vertical ‘PUMPKINS’ sign — thinking it could be a fun element to add to our decor. Luckily Jamie is usually on board with the ideas I dream up because more often than not I end up needing his help. His only request was that I didn’t put the finished sign on our front steps. (“People will think we’re selling pumpkins.”) Haha, I suppose that’s possible! 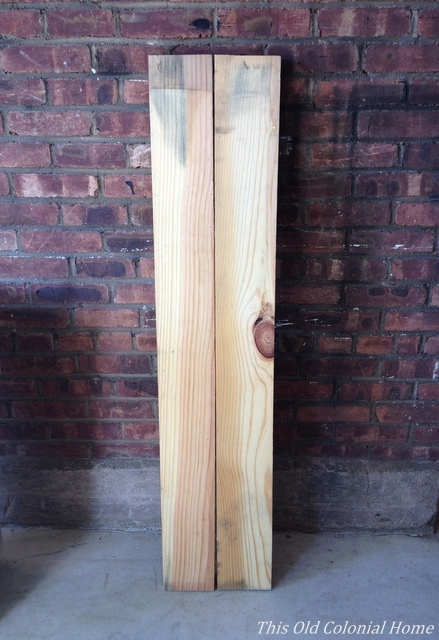 We started by taking two scrap pieces of board and lining them up vertically leaving a slight space between them. 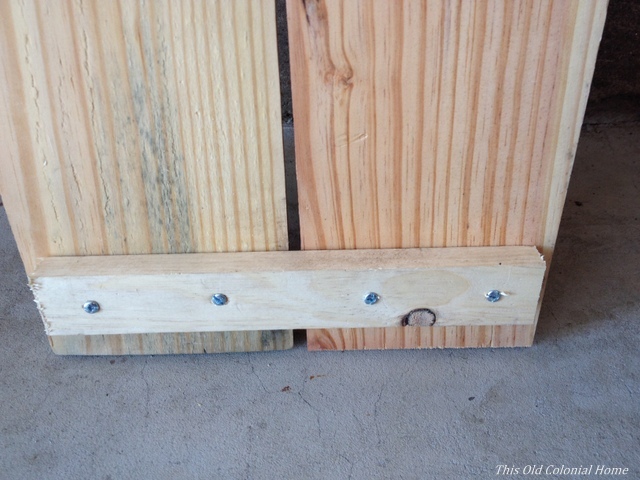 We then screwed the backs of the boards to another scrap piece at the top and bottom. 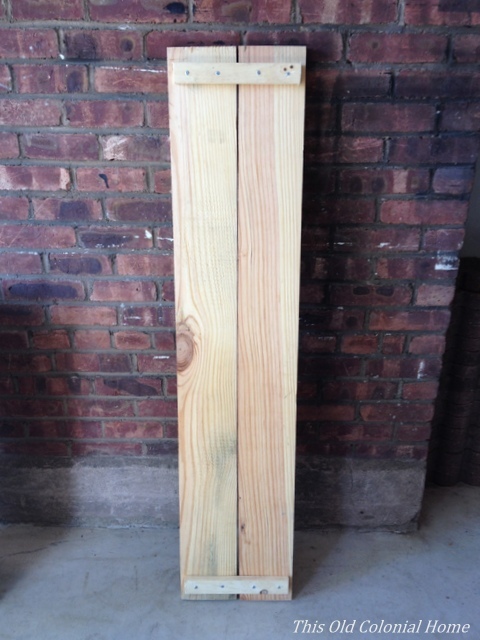 Before staining the wood, I did a little sanding to get some markings off. 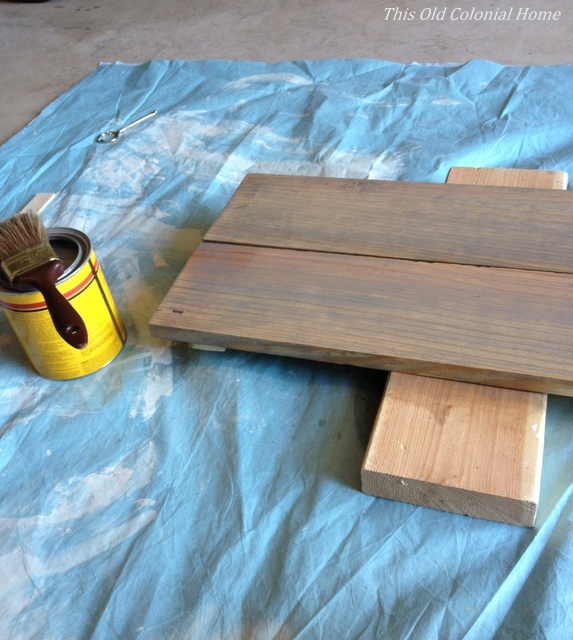 Then I decided to try Minwax Weathered Oak for, you guessed it, that weathered look. 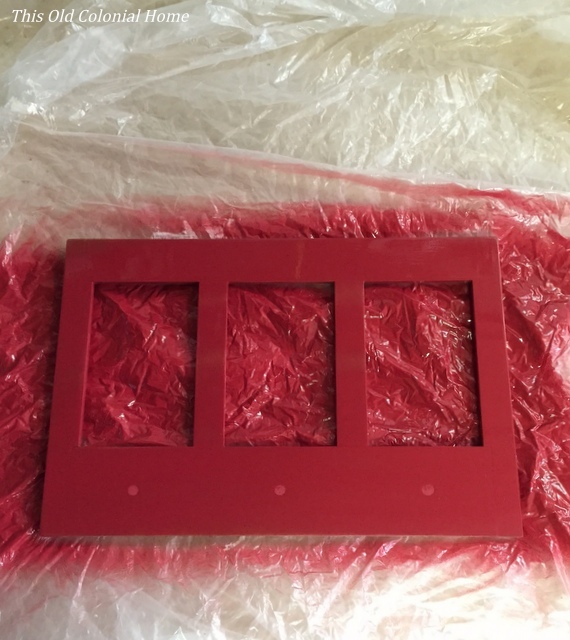 The first coat came out pretty light even after leaving it on for 15 minutes. I did a second coat, again leaving it on for 15 minutes, which helped. A third coat probably would’ve been just the ticket. Oh well. As for the letters, I decided to save some cash by printing my own. In Microsoft Word I picked the font Franklin Gothic at size 630. You’ll want to measure how big to make your letters. 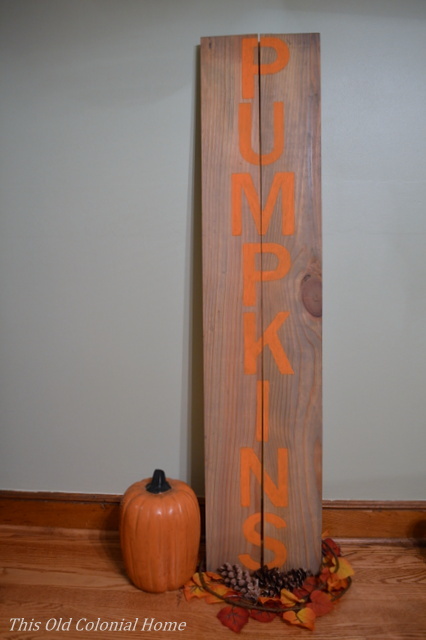 My boards were about 52″ long and I had 8 letters, so I figured around 6″ per letter, allowing room for spacing. (Yay guesstimated math!) 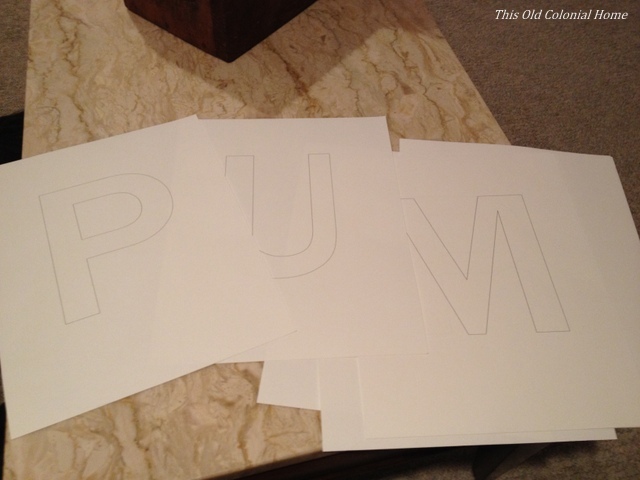 I printed each letter on cardstock paper. To save on ink, just print the outline of the letters. After I cut out each letter, I used two-sided tape to attach them to the boards. This turned out to not be the best idea because the tape stuck to the wood more than the paper. After I traced the letters there was a lot of prying up with my fingernails. For painting the letters I used Pure Pumpkin craft paint (that’s the actual color name) from Michael’s and used a small art brush to apply it. I probably could’ve used a slightly bigger brush, but I worked with what I had. And then I realized — while trying to stay in the lines and getting visible brush strokes — I probably should’ve cut the letters as a stencil instead. (Shoulda, coulda, woulda. Learning as I go!) 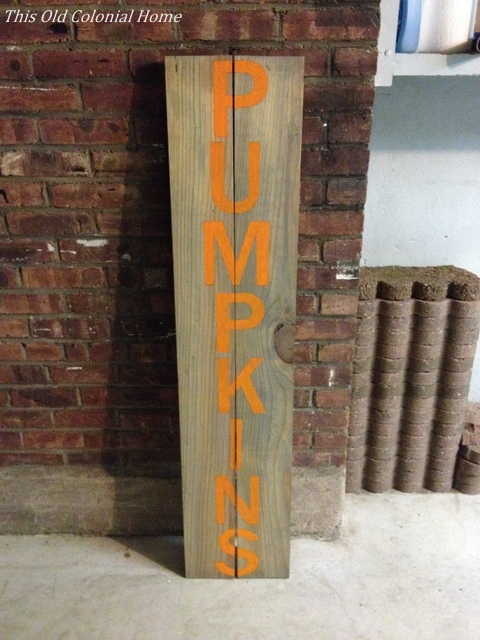 Once the letters were dry, I did a little light hand sanding using 220-grit sandpaper to dull the orange. 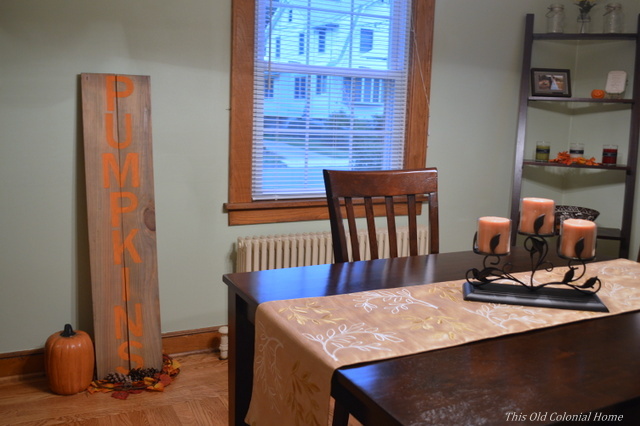 And here it is on display in our dining room (and safe from pumpkin-buying passersby). So all in all this project didn’t go quite as smoothly as I figured (does it ever?!) But I’m pretty happy with the end result and will now know better for the next time. Because let’s face it, there will be a next time! 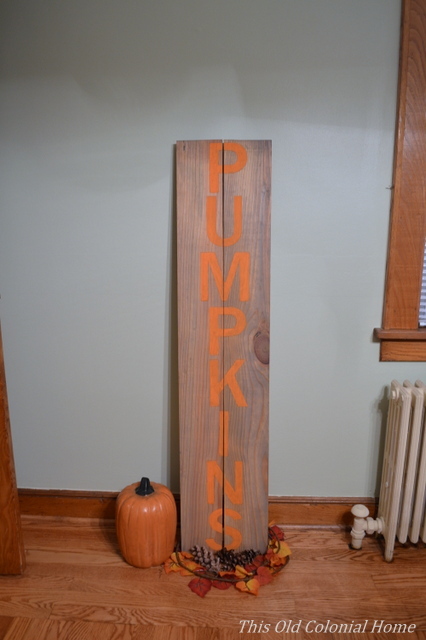 Categories: Crafts, Fall | Tags: craft paint, diy, fall decor, pumpkins, stain, wooden sign | Permalink.